Apple could be one of the biggest losers in a trade war between the United States and China. The New York Times reported Monday that the Trump administration had told Apple CEO Tim Cook that no tariffs would be placed on iPhones. But a top White House trade adviser reportedly said he didn’t have any knowledge of such an exception. There are few companies with more to lose than Apple in a trade war between the United States and China. The world’s most valuable publicly traded company does nearly all of its manufacturing and assembly in China, the culmination of a long and complicated electronics supply chain that stretches around the world and ends with the Chinese-made iPhone you may be reading this story on. So it’s no surprise that the massive tariffs President Donald Trump has threatened and China’s response could lead to a trade war that would cripple the iPhone company, and Apple CEO Tim Cook has been working behind the scenes with both governments to make sure it stays out of the crossfire. As part of a closer look at how Apple has navigated the impending trade war, The New York Times on Monday reported that the Trump administration had told Cook that no tariffs would be placed on iPhones. But a top White House trade adviser denied knowledge of any iPhone trade exemption in a conference call with reporters on Tuesday, according to Bloomberg. “With respect to Tim Cook and exceptions, I have no knowledge or comment about that,” Peter Navarro, the director of the White House’s National Trade Council, reportedly said. The Times in Monday’s report named Navarro as a trade official Cook tries to avoid, so it’s possible he hasn’t been told of an Apple-related trade decision behind closed doors. Cook reportedly has had better luck speaking with Treasury Secretary Steven Mnuchin, Commerce Secretary Wilbur Ross, and Larry Kudlow, the director of the White House’s National Economic Council. 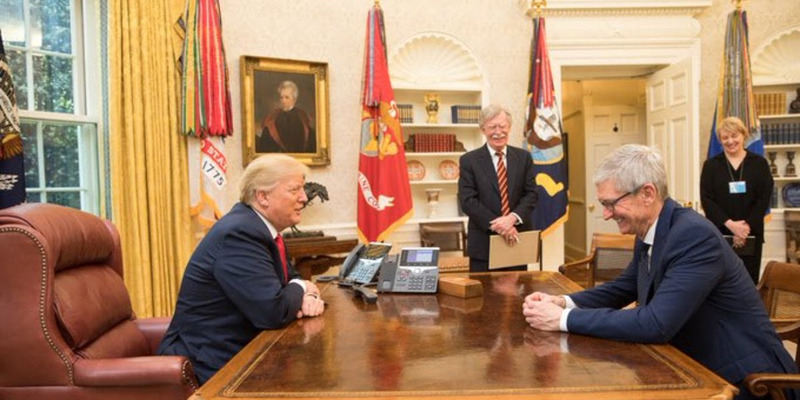 Cook maintains an open line of communication with Trump, and The Times said he visited the White House last month. Apple announced earlier this year that it planned to spend $US350 billion in the United States over the next five years, news the Trump administration used to trumpet its economic policy. The White House has not made a public statement exempting Apple from tariffs, and China could always decide to place tariffs on materials that are used to make Apple’s devices or make life difficult for Apple in other ways, such as by using bureaucracy to slow down shipments. Apple and the White House didn’t respond to emails. So it remains an open question whether Apple’s charm offensive on the White House got the iPhone company special treatment from the Trump administration. 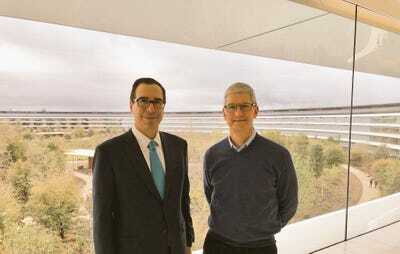 Steven Mnuchin/TwitterTreasury Secretary Steven Mnuchin, left, with Apple CEO Tim Cook.